Entrepreneurial ambition is at the heart of most companies with humble beginnings. 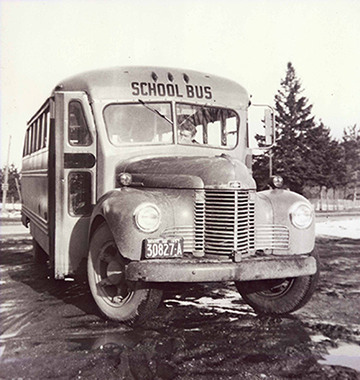 For Landmark Bus Lines, our history reaches back to 1952 when a 16 year-old Floyd Sinton borrowed $900 from his father so he could purchase a 1949 International school bus. With that, Sinton Transportation took hold and started to build a reputation that reached across regions and borders. Over the decades as it expanded operations, Sinton maintained those family-run roots and the values that have made it an essential part of every community it serves. Floyd’s son Stan eventually took over the business and continued to grow its influence and secure clients and routes in municipalities across Ontario. It was thanks to that glowing reputation that Landmark Bus Lines was encouraged to acquire Sinton Transportation in 2011. Those values that have long served Sinton Transportation continue to help guide our company forward. Being in the industry of safe and secure transport, we maintain a strong commitment to the principles of responsive service, reliability and community wherever we operate. It’s a point of pride that we can carry on the legacy that Floyd Sinton started as we continue to provide friendly, efficient and comfortable transportation for students and families for generations to come.